CONGRATULATIONS #12, Nissa. You are the winner of this giveaway according to Random.org! I am thrilled to be able to introduce you to an amazing Etsy store, GBaneyx Design. The owner of the shop, Gretchen, creates unique and beautiful earrings, necklaces and bracelets. When I first saw all of the exquisite pieces available from GBaneyx Design, I was mesmerized by the sterling silver, gorgeous gemstones, and intricate designs. Upon closer inspection, I realized that her prices were affordable, something that is a major plus for me! My only problem was that I had a difficult time choosing only ONE piece of jewelry. I finally settled on the Blue Moon Necklace. Once it arrived, I was stunned by how much more beautiful the necklace was in person! Truly, it exceeded my expectations. 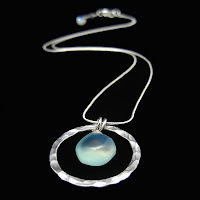 The small drop of light aqua chalcedony is a perfect addition to the hammered silver circle. I also love that the 1” extender is finished with an iridescent drop of rainbow moonstone, such a pretty little detail. I immediately tried it on and was impressed that the chain felt smooth on my neck and didn’t get stuck in my hair, like a lot of chains do. The quality and craftsmanship of my necklace is more than impressive. A piece of jewelry from GBaneyx Design would make the perfect gift- for a friend, sister, mother, wife, girlfriend, or yourself. With all of the beautiful choices Gretchen offers, you are sure to find something you have to have! GBaneyx Design will be participating a promotion for the Thanksgiving weekend around two infamous shopping days: Black Friday and Cyber Monday (Nov. 28th through Dec. 1st). Gretchen will be will be offering 20% off on all of her jewelry for the event. Would you like to win something beautiful from GBaneyx Design. for someone on your shopping list or perhaps for yourself? Gretchen has generously offered ONE lucky reader of living life one day at a time, a $35.00 gift certificate to her shop! HERE’S HOW TO WIN:• Visit GBaneyx Design., then leave a comment here telling me what item you just have to have and for whom. *Enter by 9pm (EST) on Monday, December 1. The Mystic Green River Pendant Necklace is beautiful! I would love to give one to my aunt. It would look great on her, with her hair and eyes, and I would love to surprise her and make her smile! She's always so thoughtful and generous. Looks like a great giveaway! :) I'll have to let my sister know! She'd love to enter. Thanks for linking yourself on the Weekly. You didn't put the direct link in to the post though, but I switched for you. Make sure you do that next time so people came find the giveaway immediately! Wow!!! What fabulous jewelry!! I'm so selfish, I guess; I want the Green Splash earrings for myself! They're fabulous!!! Hey girl! What a great giveaway! Love the shop - I love the Amira earrings...and many more - but if I had to pick ONE - it would be the Amira set - they are beautiful! I love the "Full Circle" necklace!! The Seafoam Bracelet is beautiful! It looks just like something my mom would wear and love! I would love to give the Copper Splash Hoop earrings to my mom. Mystic Blue Hoops, and I think I'd keep them for myself! I would pick the London Blue Hoop earrings for, um, ME! Yes, I'd keep them for myself! I love the tiered pearl earrings.. Is it too selfish that I want them for myself?? :) Thanks for the giveaway; her designs are beautiful! I'm following your blog, too. my sister would LOVE the Amira earings... I really really love the mystic green river pendant necklace. I love the color! oh wow...there are so many beautiful things! I THINK my favorite is the green splash earrings! I would want them for me! I LOVE earrings! Thanks for the chance! I would love to give the Full Circle necklace to my Mom! It is gorgeous! I like the Blue Moon Necklace. i'd buy the Moonrise at Sea Bracelet! i like the Harvest Moon Earrings and i would give them to my mother for christmas. i also like that blue moon necklace! i love the seafoam bracelet and think my sister would love it as a gift. I loved the pink stones in the Fragola Earrings. thanks so much. I want the blue moon necklace for my older sister. Happy Thanksgiving! Although I love the Verde en Espiral Bracelet and the Full Circle necklace, I think you hit it on the head with the Blue Moon Necklace - I would be that one - for myself! I need a little something nice during the holidays! Thanks! The Blue Moon Necklace is just beautiful and would go wonderful with all the blue/purples in my wardrobe. 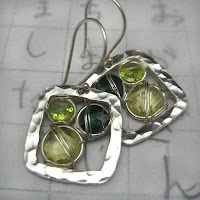 I would love to give the Green Splash earrings to my mom for Christmas. They are so pretty. Thanks for the giveaway! I would want the Verde en Espiral Bracelet for my mom!! So pretty! I like Autumn leaves.....for myself, haha, or Verde en Espiral Bracelet for my mom! The blue ocean earrings are a perfect gift for my cousin (who's like a sister to me) who just had a sweet baby girl. 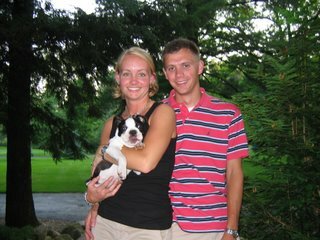 Those earrings are the color of her baby's eyes...and it'd be a nice treat for the new mom! i love the On a Moonlit Night Pendant Necklace! very unique looking! Wow, that whole Etsy store is fabulous, but I absolutely adore the red and black garnet post earrings. Thanks for the opportunity! I love the Temptest bracelet for my aunt, it is very pretty! It's hard to pick just one, but I would probably choose the Blue Ocean earrings for myself! Subscribed to your blog via reader. The Dewdrop earrings are rather ridiculously gorgeous. I NEED to win them. I LOVE the blue moon necklace. She has such an original stle! i don't have very many earrings and I NEED those copper splash hoop earrings. i love them! I like the Blue Ocean earrings, very pretty! I love the Autumn Leaves Earrings. As I am a huge earring fanatic I would love to have these beautiful earrings for myself! And I follow too! What a great contest.. thank you so much! I just have to have Blue Moon Necklace for my sister! She'll love this! Thanks! Oh I love the Harvest Moon Earrings. This is for me actually, as I have this beautiful citrine ring & I think the Harvest Moon Earrings would complement the ring brilliantly. Thanks. The London Blue Hoop Earrings are so pretty-I've been wanting a real nice pair of hoops! I commented way back (25th Nov) but am back to say I am a new follower. I love your shop! Everything in it!!!! I couldn't pick just one! I love anything with Moonstones :). It's a hard decision but I'll go with the Ciottoli di Miele Bracelet as my favorite. I'd love to win it for myself, because why can't I keep such a gorgeous piece just for me? I absolutely LOVE the Blue Moon Pendant and would give it to my sister for her birthday in January. It would be perfect! I also subscribed via reader.